We want people to see Esther and make the connection between her and the millions of pigs exactly like her who weren’t so lucky. To show that, given the chance, these amazing animals grow to become the most amazing and compassionate animals you’ll ever meet. I look into her eyes, and I see someone looking straight back. Someone who knows and loves me just as we do her. I see someone, not something. When they see animal flesh packaged at the local grocery store, it’s easy for some people to forget that the animals they eat were once living, feeling, thinking beings—beings who felt pain, fear, happiness, and sadness, just as we do, and who were just like the other animals we call our besties. 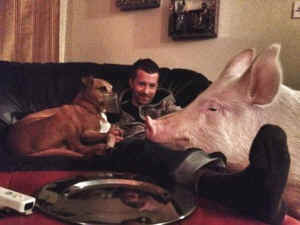 One family in Canada learned this lesson when they took in Esther, who they thought was a “micropig” but who turned out to be a pig who had been bred for someone’s dinner plate. By the time they realized that she was going to grow to be hundreds of pounds, they had already fallen in love with her. 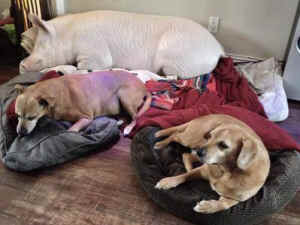 Now their mission is to give her the best life ever and inspire people to think differently about pigs and all other animals who are typically killed for food. I was lucky enough to ask Esther’s guardian, Steve, some questions about how life-changing (and FREAKING ADORABLE!) it has been to have Esther as a member of the family. 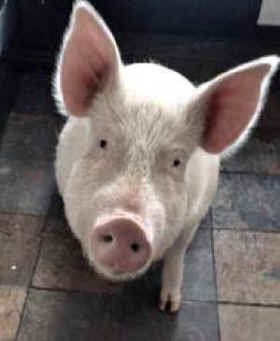 What’s the number one thing you want people to know about pigs? 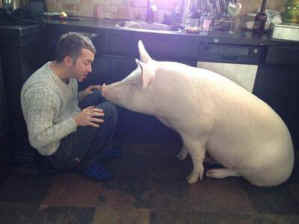 I wish people would be more aware of how amazingly smart and emotional pigs are. Despite her size, Esther wants nothing more than to cuddle when she naps. She will go out of her way to find us or the dogs to lie with. She loves to play tug-of-war and chew her toys. She also loves to play tag, and we chase each other around the backyard. She’ll run and bump my legs, then turn away as if it’s my turn to chase her. It’s hilarious and amazing. She’s also incredibly gentle. We feed her by hand and can put our fingers right in her mouth—granted we spend a ton of time with her so she is very socialized. This myth about pigs being vicious and mean couldn’t be more untrue. The only time we see any aggression from Esther is if she’s scared. I can only imagine how afraid pigs in factory farms are, and although I’m no behavior expert, I have to assume their anger in farms stems from the same thing: They’re afraid. 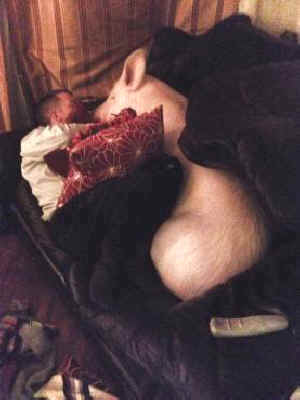 When given the chance to be loved and to be themselves, pigs are social, friendly, loving, and sensitive animals. How has having Esther changed your life? Our life has changed in too many ways to count. First and foremost, she inspired us to be vegan, and we’re working toward that now. We have our diet under control and are learning how to ensure we stay consistent in other areas like clothing, furniture, etc. It was a big change, but we feel amazing about it. She also caused some changes at home that were interesting and unexpected. Because she’s so smart, we had to childproof everything! Food was moved to higher cupboards, and doors to some rooms are kept closed. She just really keeps us on our toes. We need to be very aware of anything we leave lying around the house because she will explore it … and eat it if she can. How has Esther inspired you? This is very hard to answer without sounding weird, but I’ll try. She really just inspired us to be better people as a whole. To be more aware of how our actions, as small as they may be, can have huge impacts down the line. To be aware of where the products we use come from and how we get them. She inspired us to try and show the world the horrors we support by ignoring the treatment of these animals in factory farms. I’m not going to say Esther isn’t special because she is, but let’s be honest. All we’ve done is taken what was bred for somebody’s dinner and given her a chance to be herself. … We want people to see Esther and make the connection between her and the millions of pigs exactly like her who weren’t so lucky. To show that, given the chance, these amazing animals grow to become the most amazing and compassionate animals you’ll ever meet. I look into her eyes, and I see someone looking straight back. Someone who knows and loves me just as we do her. I see someone, not something. We see someone, too. How can you watch this video of Esther sitting for a treat and not? !